Clean and uncluttered - classic fireplace design at its finest. The understated mantelpiece supports a beautifully detailed double shelf with a lipped hearth to match. Hidden behind the inset header are a set of integrated downlights that perfectly highlight the immaculate polished marble finish. The timeless design of this suite means it is sure to sell out fast. The brushed silver electric fire which comes with both coals & pebbles, Fire has 3 settings; effect only, 1kw,2kw, with low energy LED bulbs, Assembly required and fireplace can go against a flat wall. Approximate Dimensions; Overall width of top shelf & hearth: 1219mm, Overall height from floor level: 1062mm, Hearth depth (front to back): 381mm, Depth of top shelf (front to back): 196mm. Please note the marble is best described as a cream/beige colour with a lighter coloured fleck running through it. Please note that your silver inset fire will arrive separately to the fireplace. The inset fire will arrive with two black frames screwed to the back of it. If the entire fireplace is to go against a flat wall then you will simply unscrew one of the frames (1 minute job) and leave the other frame attached (doing this will allow your fireplace to go against a flat wall). If you have a suitably sized hole in your wall then you will have the option to remove both black frames (as can see in the main product image). Each of the frames are approximately 2" deep (front to back). 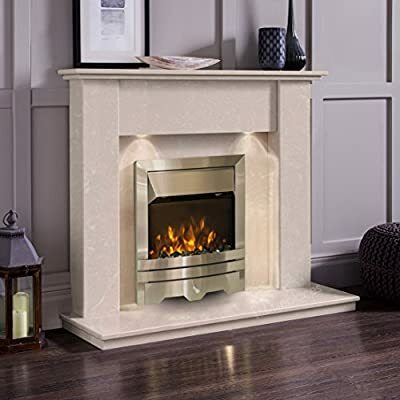 Solid Cream Marble Fireplace & Downlights - UK Mainland Only but NOT the following post code areas: IV, KW TR Clean and uncluttered - classic fireplace design at its finest. The understated mantelpiece supports a beautifully detailed double shelf with a lipped hearth to match. 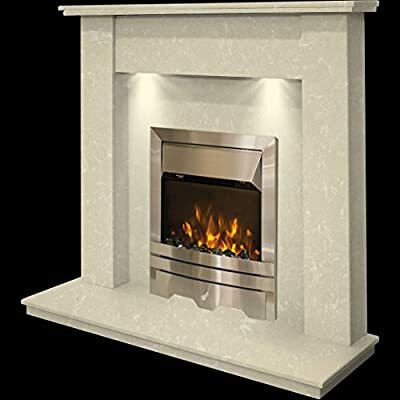 Brushed silver electric fire which comes with both coals & pebbles Please see full description (below) Low Cost Fireplaces is a trusted online retailer with over 10 years internet experience. Most of our fireplaces are made to order in the UK by skilled craftsmen who use high quality materials. Our business has gone from strength to strength in recent years due to our ongoing commitment to high quality products at low prices.